It’s down to the home stretch for Qualex-Landmark’s $110 million skyscraper in Calgary’s Beltline district. After breaking ground in October 2015, Park Point is about 90 per cent complete and expected to offer first occupancies this August. Eighty per cent of its 289 condos are now sold, and the remaining options start from the $290,000s. “When a project is completed, the home starts to live and breathe unlike renderings, which are more static,” he adds. In an upscale highrise, sightlines are a selling feature. Among the assortment of views at Park Point are Central Memorial Park, and others where the Calgary Tower feels within reach. “For years, we have been able to provide homebuyers with the view outlook from every elevation in a building using blimp aerial photography or more recently drone technology,” says Mahboubi. “The one limitation is that these do not provide the homebuyer with the exact view span until the building is completed. “For example, your view from the living room or bedroom will be different from the view on the balcony or patio,” he adds. “The balcony side screens, walls or overhead balconies from other suites will also impact view outlook. 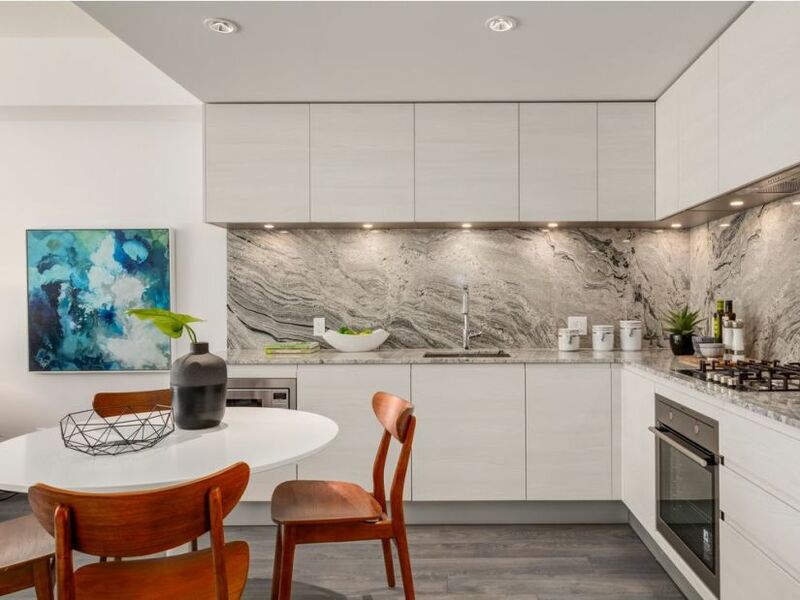 Many of the condos now have the Armony Cucine full-height cabinets, integrated appliances, and striking granite counters and backsplashes already in place. “We are after arousing an emotional response in our homebuyers stemming from a thoughtful design package that encompasses the entire kitchen space,” says Mohammed Esfahani, president, Qualex-Landmark. One of the standout elements in the kitchens at Park Point is a back-lit shelving unit. A blend of functionality and visual interest. “The tall full-height open storage component LED lit panel in behind, becomes the jewelry of the kitchen, and because it’s back-lit, you get this amazing display and capture,” says Scott Trepp, president, Trepp Design Inc. In three instances, people who bought at Park Point didn’t just get one condo, they selected two. Flexibility available with certain floor plans allowed them the ability to have the developer make them into one home. This was Qualex-Landmark’s first time implementing combined suites in a Calgary development. “This approach allowed homebuyers to select from two combinable suites that are side by side to create a larger suite of their choice, and it was certainly well received,” he adds. The combined suites route resulted in some early design challenges. “This involved overcoming plumbing and structural hurdles,” Mahboubi says. “For example, plumbing in kitchen and bathrooms still need to be vertically aligned with the suites above and below the combined suite. The suite layout also needed to work around structural walls and columns. Whether it’s the backdrop for a sunny afternoon with a good book or views from amenity spaces, or the condos, themselves — Central Memorial Park plays an important role at Park Point. Standing on the now constructed Pilates deck, that connection is clear. “We believe that the proximity of the Park Point residential community on Central Memorial Park directly correlates to a healthier lifestyle and the propensity for homeowners to increase their physical activity, either within the project utilizing the building amenity areas, or encouraging them to walk across the street to the Central Memorial Park,” he adds. Both the high-end lobby and building’s zen garden are also starting to take shape. The double-height lobby will boast seating, a stone reception desk, marble flooring, and a luxurious leaf-inspired chandelier above it. There’s a stand-alone wall behind the reception desk wrapped in polished black marble. "My experience with Qualex-Landmark has been second to none. Their commitment to customer service is remarkable.Their passion for the homes they create speaks volumes. I would not hesitate to recommend Qualex-Landmark to my family and friends."